Mongolian Lamb is also known as Tibetan Lamb or Curly Lamb. We are calling it Shaggy Sheep! Whatever you'd like to call this wonderful natural sheepskin fibre, it's gorgeous with highly textural "threads" of trailing gorgeousness. We've dyed our Mongolian lamb scarves in a few dramatic colours, so that one has a retrospective peek of the sixties - think Boho Chic, midi and maxi lengths. If you weren't part of this movement, engage now! It's HOT!! My Mongolian Lamb scarf is a truly beautiful creation and quite unusual! Great price too! Thanks a lot :) You have the most fabulous stuff on your website, Ms Possum. I'll have to save up for a special occasion! Shaggy sheep is shabby chic! 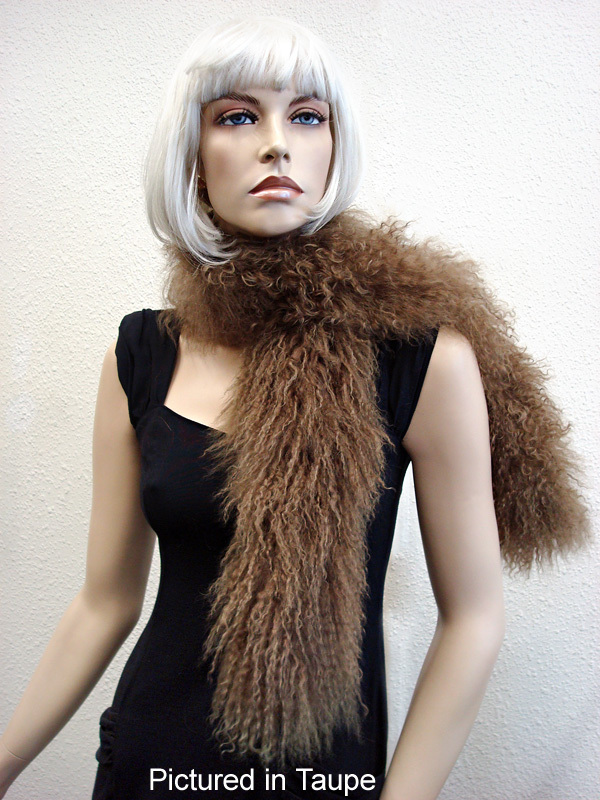 Yes, this lovely new Mongolian lambskin scarf is sixties cool with avant garde allure. Measures about 112cm plus in length depending on the length of the fibres which elongate the measurement further. Drape asymetrically over the shoulder, knot at centre front or let it hang on either side of the neck - the choice is yours. What a great price for this drop dead gorgeous number - just to give you an idea of comparative values: a Prada Mongolian Lamb stole a tad bigger than this retails for a staggering NZ$1410!! To "bouff up" this Mongolian lamb scarf further, simply brush. To lessen "boufiness", apply a damp hand to fibres. The pictures of colours are representative - each scarf will be slightly different in tonings and texture due to the degree of "shagginess" of the fibres! More colours coming soon but they will all be different, so be a speedy camel for this New Zealand made Mongolian lamb scarf with limited edition colour offer! !